Mumbai Safai Karamchari Recruitment 2018 If you are searching Bank of India Safai Karmi Recruitment 2018 than on 27 August apply and visit as soon possible Bank of India 99 Safai Karamchari Recruitment 2018.The main process of Mumbai Bank of India Safai Karmi Jobs is given below. Konkan Railway Group D Recruitment 2018 Konkan Railway Recruitment Board has sent communication to all 10th Pass Eligible candidates from State Board or Central Board of Secondary Education. The Posts are Track Man, Assistant Points Man, Khalasi divided into Mechanical, Electrical, S& T. For More details Group D vacancy in Konkan Railway Corporation and its upcoming programme of Admit Card, Result. You should search on No. CO/P-R/ 05/2018. Rajasthan Police Constable Result 2018:- The result of the Rajasthan Police 13,142 vacancies shall be declared after the candidate has passed all the Rajasthan Police Battalion Result 2018 and the Rajasthan Police Constable Physical Result etc (Medical, Document Verification). Chhattisgarh Police SI Recruitment 2018 Commander in Chief of Chhattisgarh has invited 655 SI Recruitment 2018 before the last date 16 September 2018. If you are living in CG and holds the responsibility as Sub Inspector in CG Police Department than here is opportunity to grab CG 655 SI Recruitment 2018. DBRAU Agra University Migration Form we have a DBRAU Migration Form that requires to talked admission in Latest College Admission through DBRAU Provisional Certificate 2018. 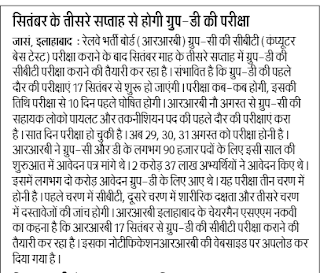 More than 1,000 candidates passed from Agra University Affiliated colleges with in 6 month or every year. To take admission in next class or other University they want you Agra University Migration Certificate issued after passing written exam any courses. UPPSC Ayurvedic Homeopathic Medical Officer Admit Card 2018 Hello friends check the 1140 vacancies of Medical Officer Screening Exam Test held on 30 September 2018.This News updated on 27 August Hindi Newspaper official website and Paper. BU Bhopal Date Sheet 2018 BU Bhopal Formally Known as Barkatullah University recently established the Annual/ BU Bhopal Semester Exam Date 2018. If you are BU Students in the name of 3 year Graduate students or 4 years, Diploma or Master 2 year Post Graduate courses than you should need latest Barkatullah University BU Bhopal Date Sheet to check your time table. Delhi Pre Matric Scholarship Delhi Government has made facility to category of School Students who are SC ST and searching for Delhi Pre Matric Scholarship Latest News. Delhi Government recognizing the scheme of Pre Matric Scholarship from 9th and 11th Class Students. The Main Aims Scholarship to SC ST Girls/Boys is to make them bricks of Meritorious Marks, Stand with current education system of India. V Mart Scholarship:- Vmart Recently launched the V-Mart Ujjwal Bhavishya Scholarship Scheme to 750 Meritorious Students. Rs 10,000 have been made to all applicants who apply as V-Mart Bhavishya Jyoti Scholarship. V Mart is in Business of Retail Chain connected across 14 States of India. Mart has more than 150 Stores widely spread after Big Bazaar, Pvr Malls, Mega Mart and other Malls which provide basic entity, life households. RRB Group D Level 1 Exam Date 2018 this is Confirm news of Railway Group D Exam Starting from 17 September 2018. On 27th August Times of India, Leading Newspaper publicly announced the date said to be Railway Level 1 Group D Exam Date 2018. Many people believes Railway offer admit card from 27 August to 4 September 2018 due to expectation of 4 September as RRB Level Group D exam. But this surprise comes after celebrating Raksha Bandhan when people reach their home on 26th August.